This piece was eventually translated into a large painting. FLANKING the Pahang's Kuantan Rivermouth and facing the South China Sea are two idyllic fishing villages that are slowly being swept away by the waves of development. Located on the northeastern side of the estuary is Tanjung Api, and directly opposite it is Tanjung Lumpur. I have been to the Tanjung Lumpur fishing village many times through the years when visiting Kuantan. It is more famous for its seafood than Tanjung Api, boasting a number of big restaurants. However, I feel Kampung Tanjung Api, as it is better known, has more character, thanks to its wooden houses on stilts and makeshift fishing huts that dot its short coastline. 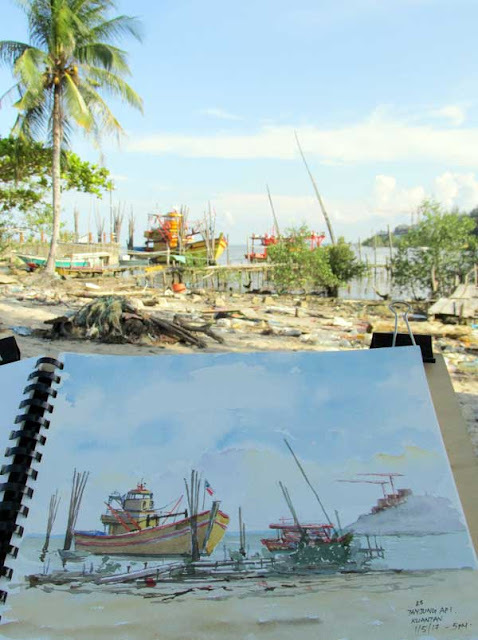 The evening I was there, the good weather and blue skies allowed me to do a piece on fishing boats in Tanjung Api. They were moored at the edge of the coastal swamp land after the esplanade, separated from the beach by a thick line of flotsam and mangrove saplings struggling to gain a foothold. The sun was on its way down and the dissipating heat drew anglers to the concrete pier. Some distance away, children were seen diving in for a cool dip from boardwalks nailed to rotting bakau trunks. Tanjung Api is the destination of choice for anglers although a few eateries are also drawing loyalists to their premises. 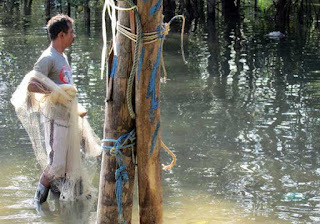 According to one angler, anglers like this place because the water is deeper than in Tanjung Lumpur and chances of landing a big catch is much better. The esplanade here is also quite large and can accommodate many anglers without their lines getting entangled at each cast. I was told that photographers and artists love this side of the Sungai Kuantan estuary simply because of its rugged geography. 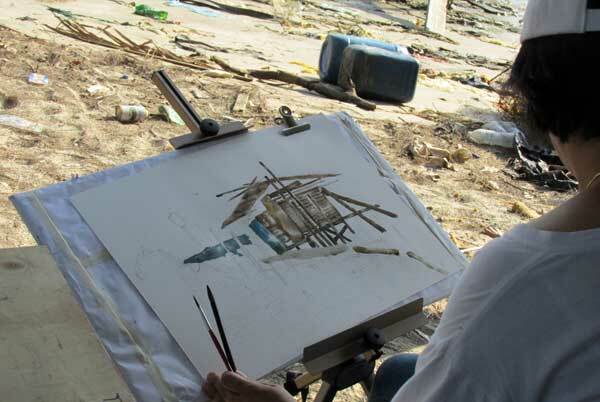 There are plenty of subjects in the form of wooden houses on stilts, debris from the sea, and rickety boardwalks reaching out to the boats moored at the water’s edge. If you are lucky, in the afternoons when the sea is too rough for boats to go out, you may catch sight of fishermen making fish traps known as bubu. I got acquainted with a couple who were also enjoying the outdoors painting that evening. At a small river at the end of the village, I met a local fisherman who was casting for fish. When I asked him what was he looking for, he replied that he was casting for a tilapia species that have adapted to the brackish water there. “Not big but enough for a decent meal tonight,” he replied, as his wife looked cautiously at my camera. From Tanjung Api, I could see that development is coming fast and swift to its riverine neighbour on the opposite bank. Two tall cranes were clawing at the skies on top of a huge complex; perhaps another hotel? As I left the place with a painting in hand, I was very sure that when I return again in a year or so, there will be fewer fishing boats to paint on either bank. I hope that Tanjung Api will not lose its charm. From Kuantan town, drive to Jalan Teluk Sisek towards Tanjung Lumpur. At the traffic lights, turn right but do not go up the bridge to Tanjung Lumpur. Instead, keep to the left and turn in at Jalan Padang Lalang. Go straight for about 1.4km until you come to Jalan Selamat and turn right. In about 500m, you will come to the junction with Jalan Tanjung Api. Turn left and look out for Lorong Tanjung Api 11 and turn in there. The esplanade is about 400m away. Look out for the Tanjung Api Mosque, which sits just at the entrance to the esplanade. You can use Tanjung Api Mosque, Kuantan, to approximate your search for its location on Waze. Soon the skyline of the river mouth will change with condominium up.